A Colombian guerrilla leader has been found and killed, the country's president says. Walter Arízala, known better under his alias Guacho, was wanted for the murder of two Ecuadorean journalists and their driver earlier this year. 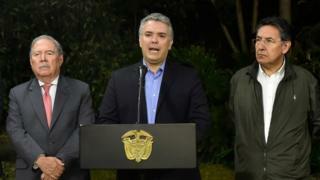 On Friday, Colombian President Ivan Duque said he was killed in an operation near the Ecuadorean border. In a statement Mr Duque described him as "one of the most horrendous criminals the country has known". "The message is clear, we won't take a step back in the defence of legality, life, honour and the property of Colombians," Mr Duque said. On top of killings, Guacho was also suspected of drug trafficking and extortion. The 29-year-old was a former member of Colombia's Farc rebel group. He is one of thousands who have refused orders to lay down arms after the guerrilla group signed a peace deal with the Colombian government in 2016. Guacho broke away from the Farc and founded the Oliver Sinisterra Front - a dissident gang thought to have about 70 to 80 combatants operating around the Colombia-Ecuador border area. The group came to international attention earlier this year after kidnapping two Ecuadorean journalists - 32-year-old reporter Javier Ortega and 45-year-old photographer Paúl Rivas - along with their 60-year-old driver Efraín Segarra. Two weeks after seizing the three, the group announced they had "died" when the army came close to where they were being held. Shortly after their bodies were recovered, the group were also blamed for the murder of an Ecuadorean couple. Oscar Villacís, 24, and Katty Velasco, 20, went missing from Puerto Rico, a rural area near the Colombian town of Tumaco, on the border with Ecuador. A video of them, restrained with ropes around their necks, was released by the Guacho's group days after their disappearance. The couple were later found dead with stab wound injuries, and their bodies were flown home to distraught relatives. The murders led Guacho to become a top target of both countries' governments. Colombia deployed more than 3,000 members of its armed forces to search for the group's leader "dead or alive", Reuters reports.